With IBC wrapping and HD Expo (nee' Createasphere) and Photokina right around the corner, the web is a flurry of new product announcements and developments. Arri Alexa and Colorfront On-Set Dailies: This software is designed to solve the issue of efficiently making digital dailies that reflect the production's intentions from the Log C 444 material the Alexa generates. This is something I've been thinking a lot about lately as a DIT has to find something to do with a camera that basically shoots a digital negative. AJA Ki Pro Mini: I'm a huge fan of the Ki Pro but it's always had an issue - it's too damn big! That cage they made to fit the recorder in between the camera and the tripod just wasn't a practical solution. You need to be able to be mobile at a moment's notice and the Ki Pro Mini being the size of a Dionic 90 battery gets you there. ProRes 10 bit 422 HQ to compact flash cards for $2000? Sign me up. How about those aforementioned digital dailies...? Dailies that are on-line quality to boot. Digital 35mm camcorders from Sony and Panasonic. AG-AF100 will be out by the end of the year. Sony's by early 2011. I think we'll be seeing these cameras everywhere we saw the lens adapters and everywhere we're seeing the SLR's now. Maybe even more so in the case of the SLR's because audio recording is so much more practical with an actual camcorder (no kiddin'). "Is this is the camera we've been waiting for?" We'll see. I'm assuming this is the model intended to compete with the AF-100 but I'm not certain. I won't be able to make it but I'm sure there will pics and vid of the thing floating all over the web come Wednesday morning. If the AF-100 is to the HVX200 what this camera will be to the EX3 than I'm already sold. The 3 with its deep paint menus and engineering essentials such as TC IN and OUT and GENLOCK is hands down the best camera in its class. Put a big chip in it and a PL mount and here's my down payment. RED's effect on the second hand PL lens market drove prices up enough but once these things are everywhere, I wonder how much a set of Super Speeds is going to run you... Someone is going to have to come up with a decent set of dirt cheap PL primes. As far as price goes, I'd say the RED Pro Primes aren't quite "dirt cheap" but close at least compared to a set of Cooke's or Master Primes. The problem is they're way too heavy for these small camcorders. I'm going to go out on a limb and assume that the mounts will be similar to what you find on an Sony/Panasonic ENG B4 mount camera - flimsy aluminum housed in plastic. Definitely not sturdy enough to hold those RED primes without a lot of additional support. Screenplane X-Y mount: This ingenious device solves the massive issue of lens tracking with zooms for stereoscopic 3D applications. Most zooms, even very nice expensive ones aren't designed with 3D in mind and they simply don't track (stay on the same X-Y axis) throughout their entire range. This means that if you want to be able to zoom or even use the lenses as variable primes when shooting 3D, you either have to have the lenses tracked at the rental house or every zoom is a re-alignment. 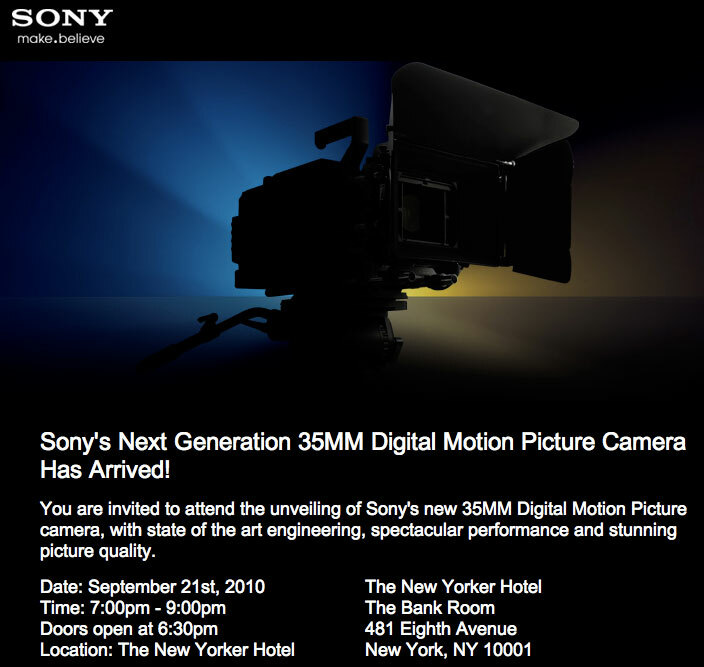 Sony "EX3D": According to FDTimes, this camera has adjustable I/O (Inter-Axial Lens Distance). If you can't control the I/O, you can't control the 3D. If there was anything I gleaned from the 3D feature I recently worked on, you're usually working with a very small I/O, 1/4" or 1/2" between the 2 lenses. Granted you're not going to be able to get that kind of closeness without being in a beamsplitter as in side by side you're limited to however physically close your optics can be to each other. Good 3D is often a subtle effect and you can't be busting people's eye balls for 90 minutes straight. Realistically, in the case of the Panasonic 3D-A1, there's not a whole lot you can do with 2.5" Inter Ocular. Good for shooting bridges and buildings but not much else. With that much I/O, in order avoid creating so much parallax that you make people cross eyed, you can't be any closer than 15 or 20 feet to subject. I'll reserve judgement until I've actually had a chance to work with it but on paper there are some obvious limitations. Arri Flicker Free HMI's designed for 1000+ fps use. This is a big problem for high speed videography as the MOS sensors are naturally daylight balanced and unless you have several HMI's on multiple phases, you can't really use them at frame rates higher than 120 as you'll start to see some flicker. To get the best images it's ideal to stay close to the native color temp which has been an issue in the past because of this. These 1000 Hz ballasts solve the problem. Italian eye wear company, Luxottica, will build passive polarization into prescription eyewear for a better 3D viewing experience. Coincidentally, Oakley (aka RED Digital Cinema) will be the US brand for the product. How interesting indeed. Building passive polarization into sunglasses may be coming next. Stereoscopic billboards anyone? Panasonic Mass Market 3DTV's. 50 inch screen for $2000, 42" for $1700. Still not quite cheap enough for most but the manufacturers seem to be in huge hurry to get them out there as the first consumer 3D TV's only started showing up within the last year. In another year, I predict there will be be sub $1000 models available. Then I'll buy one.